A red sun and hazy skies were the dominant signs of the Camp Fire raging some couple hundred miles away from Carlmont High School. Up north, desperate evacuees flee the flames. 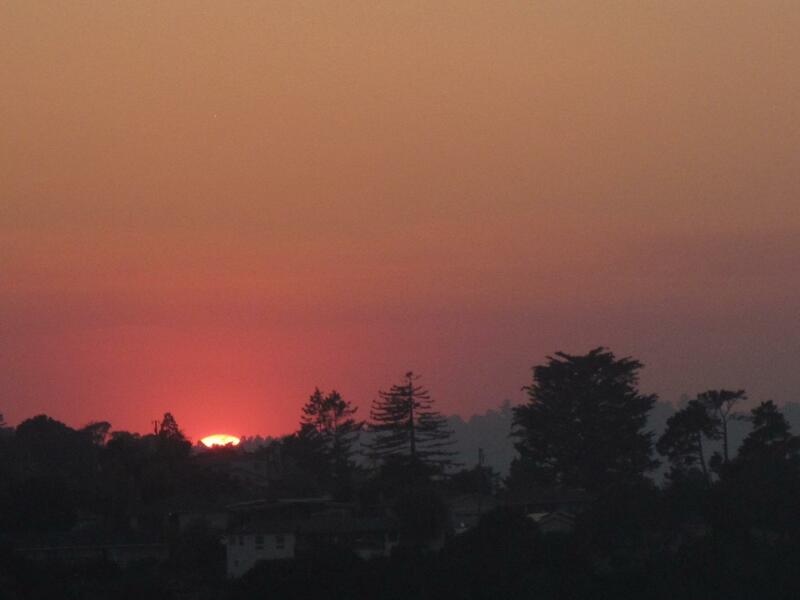 Down here, residents are under an unsaid house arrest while a thick smoke drapes over the Bay Area city skylines. The spark that would evolve to the deadliest wildfire in the state’s history began early last Thursday morning, Nov. 8, in Butte County. As of Monday, Nov. 12, the fire has consumed 113,000 acres, about the size of San José, Calif., the Washington Post reports. With a careful watch on the Air Quality Index (AQI), Carlmont coaches have already begun canceling practices for outdoor sports. John Lilygren, a coach for Carlmont’s cross country team, called off outdoor practice Thursday afternoon when the AQI recorded levels of 150 and above. “After last year’s Wine Country fires, I know that a fire can mean bad air for days. I canceled practice because I could smell the smoke in the air — running in bad air is not healthy. I think it was better to give the team a rest day rather than have them run in dirty air,” Lilygren said. The scheduled 2018 Cross Country Championships have likewise been postponed until Nov. 17 in light of the poor air conditions. However, Ava Bozic, a freshman, still had soccer tryouts that Thursday evening. “Physically, I did feel symptoms of a cold during practice and could definitely feel the air quality impacting my breathing. As for the school day, you could actually see the smog in the sky through the lights and sun, but I didn’t notice much until the end of the day when someone pointed out the smell to me,” Bozic said. Soon after, Friday’s soccer tryouts were cancelled. Ava Bozic’s mom, Natasha Bozic, also began to notice the subtle shift in the surrounding environment before the expanding consequences of the Camp Fire were confirmed. Sports practice participation was reflected by student activity throughout the day; students could be found hurrying across campus during the seven minute passing period with paper masks slapped across their faces in an attempt to filter out poor air. Lunchtime likewise saw packed hallways, closed doors, and lonely tables vacant from their usual noon visitors. If such warnings discouraging exercise in the conditions described were ignored, regular exercise in the polluted air would raise risks of cancer, heart disease, and diabetes, according to Runner’s World. This story was originally published on Scot Scoop News on November 13, 2018.